Landing in the “middle of Middle Earth” (as Wellington airport and the Te Papa museum reminds its visitors) was 14 years in the making for me. I had dreamed of coming to this country since I was a teenager and finally, here I was. I didn’t want all of my time here to be about the Lord of the Rings (LOTR), but I certainly was not going to pass up the chance to check out as many film locations as possible. Inevitably, I ended up nerding out all over the place. From hiding from a Black Rider in Mt. Victoria Park to walking barefoot through Hobbiton on the Alexander family farm, here are the locations I visited on the North Island. Looking for South Island locations? Go to this post. I skipped buying a confusing book on where to go and didn’t bother paying for overpriced tours (upwards of $200 or more!) or else I’d be tethered to their set schedule. Instead, I sought out film locations predominantly on my own time. This always allowed for more flexibility and, of course, deviation off the beaten path. I used a combination of New Zealand’s Department of Conservation (DOC) website which lists film location coordinates and a very handy Google Earth map file which marks film locations all over the country. With these copied and downloaded, I could view them even if not on Wi-Fi. Offline access is very important when markers would sometimes take us to extremely remote locations. Trying to find some of these locations was half the fun of actually arriving and getting to see them! Before I even left on any road trips, however, I was introduced to many film locations right in the city of Wellington. Wellington city is home to the Weta Workshop and film studios at which the Lord of the Rings (and Hobbit) movies were created. I could have spent the $24 NZD to get a tour of the workshop and see much of what I have already seen in behind-the-scenes videos. But then a Base Backpackers staff member offered Harald and I a free tour Wellington film locations. The walking tour brought us to 4 main spots, all just a few short meters from each other and walking distance from Wellington city center in Mt. Victoria Park. Follow a trail off the main path to reach this location from the extended version of the first film. 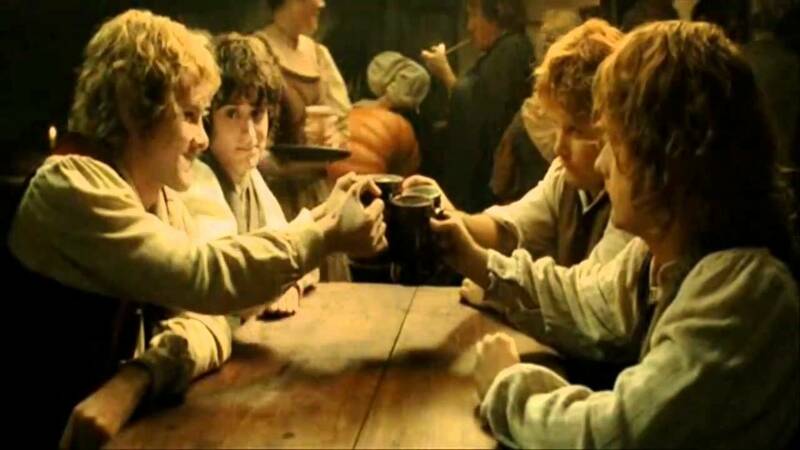 In an extra scene before leaving the Shire, Frodo and Sam stop to camp and Frodo sits in a tree smoking a pipe. A sign on the main path points to the “Hobbit Hideaway.” Before you arrive, there’s a ledge to your right and a steep slope up to the left. Three trees mark the location--a short broken stump on the left and then two full trees positioned to the right of it—where Merry, Pippin, Frodo, and Sam fell down the slope on the way to finding mushrooms on the road. With only one person short, Harald, the tour guide and I could not pass up the chance to act out the scene anyway. Down the path on the right is the location where the hobbits huddle up after Frodo tells them all to “get off the road!” The Weta Workshop created the huge tree with its reaching roots to the right of them in the screen shot. The location today is just an empty space trampled by tourists against the path ledge. But sitting there, I could almost imagine the Black Rider stopping to sniff the air above us. A bit deeper into Mt. Victoria Park’s forest is a path leading straight up the hill to a clearing. 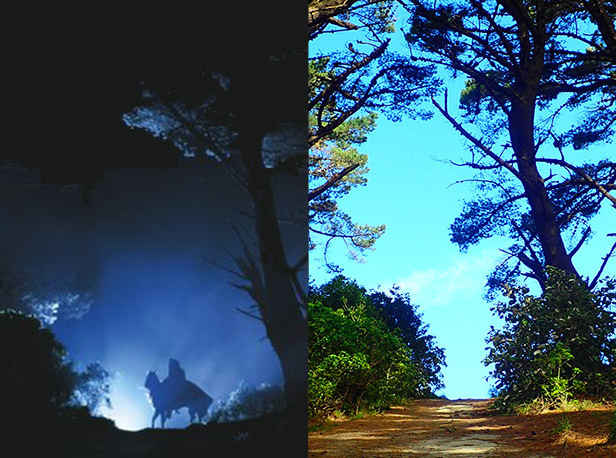 This is the scene famously on many movie posters in which the Black Rider stands on top of the hill with the moonlight behind him. The Google Earth map took Harald and I into a residential area looking for one of the many film locations for the fellowship’s ride down the River Anduin. We pulled up near a walking path between two kiwi homes and out walked a woman in her 60s. She asked us if we were there to see the film locations. She pointed the rest of the way. Over a bridge into Harcourt Park, you can look down at the Hutt River to see where they filmed some of the scenes after the fellowship visits Lothlorien. Harcourt Park is worth a visit, too, while you’re there. Scenes of Isengard’s gardens and where orcs knocked over trees were filmed in this park. Simply enter Kaitoke Regional Park off Rte. 2 and follow signs for “Rivendell” to the car park. Walk across the stone bridge and turn left into the area where Elrond’s house was built. Kaitoke Regional Park was one of the few locations I visited in all of New Zealand with actual on-site acknowledgement that filming took place there. There’s plenty of markers, information, and even a newly built set piece placed in this part of the park to ignite nerdy stirrings. 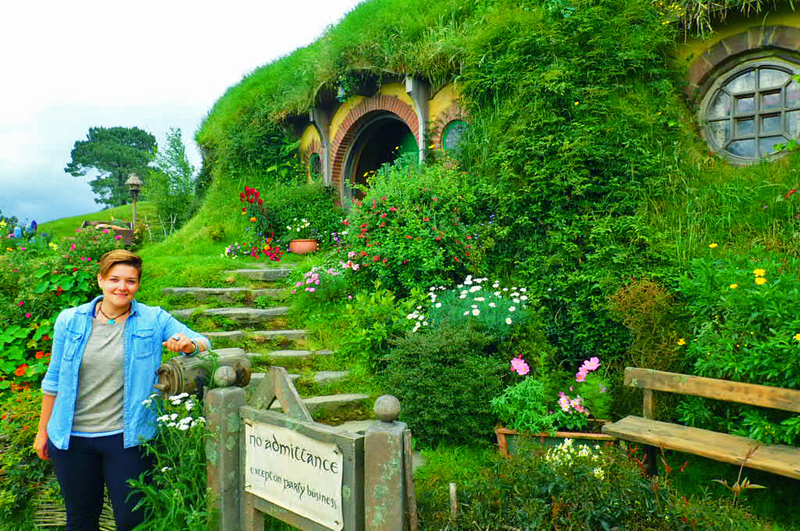 The one tour for which I did pay to see was the set of Hobbiton. This set is only accessible with a ticket because it’s on a private farm. I have to say, this tour experience was worth every cent of the $75 NZD price. I went with Erin. It was the first activity we did together after I picked her up from the airport to begin our road trip. It’s about a 2 hour drive to Matamata south of Auckland. We booked our ticket at the incredibly nerdy looking i-Site in town and then drove ourselves over to the farm. A bus took us along the road built by the New Zealand army up to the set location. 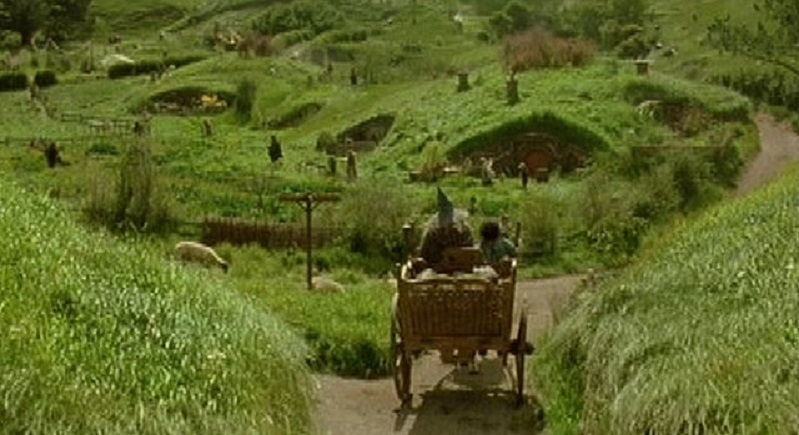 Along the way, the bus driver offered great insight into how Peter Jackson knocked on the Alexander family’s door to ask them if they could use part of their land in the original Lord of the Rings films. Can you imagine what that must have been like? Today, one son runs the actual farm and the other son runs the tourism side of it. Tours of Hobbiton have been going on since just a few years after the original 3 films came out, but back then the set was tore down leaving an empty hillside with only hints of leftover hobbit holes. Today, the location has sprung back to life with the recent Hobbit films. It’s a fully functioning tourist stop, employing hundreds of local kiwis and travelers visiting for temporary work as gardeners, painters, bus drivers, tour guides, baristas, cashiers, and more. Our tour guide was a local who just loved working there—“What’s not to love? I work in a fantasy world!” she said when I inquired about her job satisfaction. She took us off the bus and along the path through which Gandalf’s wagon originally rode when he entered the Hobbit village in the first LOTR film. Walking between the shrubbery, this small piece of the Shire sprang to life before my eyes. Bright flowers, winding foot paths, colorful round doors in the sides of the hill, and, of course, the iconic party tree. The place is truly magical—a movie time capsule and a snapshot of Tolkein’s imagination. I was overwhelmed with joy and awe over the amount of work and detail put into designing and sustaining the place. Even young children on the tour were hamming it up, pretending to be hobbits! I took off my shoes at one point to feel authentically like a hobbit, not caring that everybody else was still wearing theirs. I also could not pass up the opportunity to jump over the fence like Bilbo does at the beginning of the Hobbit—“I’m going on an adventure!” Well, actually, I’m already on one! It was fun getting to stand inside the doorways of some of the hobbit holes, too. You could go inside some, but there’s just a couple of feet of space behind the doorway. The inside of Bag End was filmed at the studio in Wellington! At the end of the tour, we were taken across the stone bridge into the Green Dragon—a fully operating drinking and eating establishment. Here, we could choose from a complimentary glass of cider, beer, or soft drink. We chose to drink the cider which is brewed and only available on location! I We also tried, not one, but all three of the available hobbity treats: scone, muffin, and cake. All in all, a wonderful experience. In previous posts, I wrote about my trek on the Tongariro Northern Circuit. I hiked through the volcanic wastelands where Frodo and Sam dodged behind huge lava rocks to hide from Sauron’s ever watchful eye. Only the circuit (and not the crossing) will take you through the parts of the park where Mordor was filmed. Both days of the circuit walk involve circling Mt. Ngauruhoe, the volcano used in the films as the iconic Mt. Doom. On a separate occasion, I returned to Tongariro National Park (yes, for a third time!) just to conquer Mt. Ngauruhoe. On this occasion, the snow had melted revealing its beautiful red and black coloring, making it look more menacing than ever before. On the way up, we kept stating how much it really felt like Mt. Doom because of how hard it was to climb. Three steps up meant two steps sliding back on the loose tephra. But rock scrambling up the hardened part of the mountain made it a bit less defeating. The 2.5 hour climb was well worth the strain. At 2291m (7516ft) high, Carolina and I could finally see over the top crater. Inside were the ashy remains of lava from years before—the old fires of Mt. Doom! We were teeming with nerdy delight. Many other climbers who had reached the top were feeling as nerdy as us, cracking jokes about throwing a ring into the crater or hilariously playing lines form the movie soundtrack on a recorder. The top of Mt. Ngauruhoe even steams in one spot, making it feel like the active, ready to burst, mountain of Mordor. On the way back down, Carolina and I felt actual fear as we slid down on loose rocks over sheets of hardened volcanic ash. We had a few moments where we thought we’d end up sliding all the way down on our asses, scraping ourselves up the whole way. Eventually we found parts of the mountain where the tephra was deep enough to sink into, stabilizing our feet as we rode down it like skiing on snow. Conquering Mt. Doom was definitely a necessary feat after being too worn out to do it the first time and visiting most of Middle Earth during the weeks in between. If you’ve been there or seen them, I’d love to hear about it! Perhaps I’ll get the chance to go in the coming weeks. Either way, I had a great time adventuring to the places I had the opportunity to visit. Middle Earth may have been imagined up by J. R. R. Tolkein, but after traveling all over New Zealand’s North Island, I was already convinced he must have traveled there to at least get some inspiration. New Zealand really is Middle Earth—and the South Island was about to feel even more like the land of hobbits, elves, dwarves, and orcs! Click here for my post on film locations from New Zealand’s more remote and geographically epic South Island.